different specializations (familiae) of gladiators, according to the outfit and the weapons used. With the expansion of the empire many different kind of soldiers of the peoples conquered by Rome were represented, and of course also the training was specialized. In the ludus, the gladiator used for the training a wooden sword called rudis, and also training weapons heavier than normal ones. In the school, the future gladiator learnt the art of swordsmanship by doctores, who were former ex-gladiators, each one specialised in a category of gladiator. We know of 15 definite classes of gladiators (Auguet), but there are some monuments that reproduce classes of fighters we dont know about, and sometimes it is difficult to categorize the different specializations, since there must have been variations within the same class. One must also think that gladiatorial shows lasted for five centuries, therefore there must have been some changes during the ages. However, scholars strongly disagree about the classification of the gladiators: the documents are few and we lack a general description of the subject. 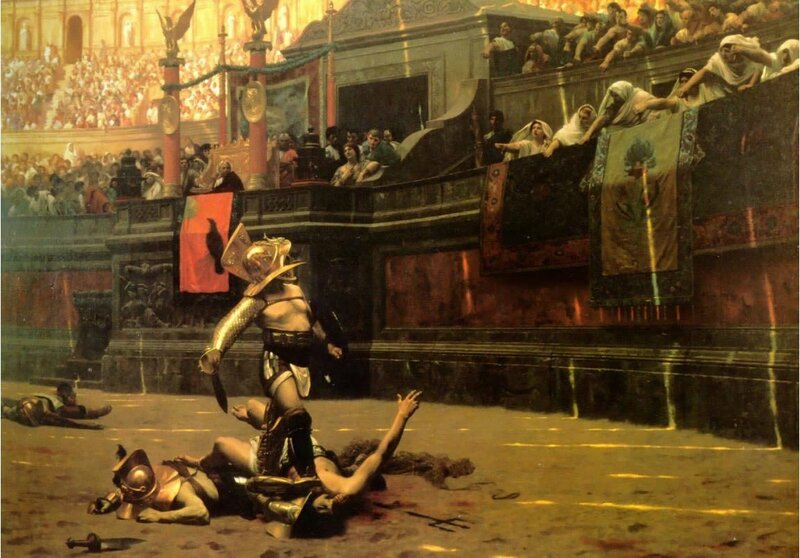 In any case, the pairs of gladiators who fought in the arena were fixed: usually the fight was balanced, in the sense that a gladiator provided with more offensive weapons had less means of defence. 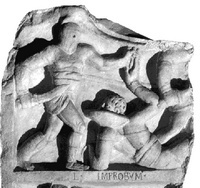 Fighting techniques followed traditional patterns or figures, therefore the combat was an art well known to the public, who expected a professional performance and could approve and disapprove of the manoeuvres of the gladiators like we do today when we watch sports. The public hated monotony and repetition and appreciated the courage and the display of bravery. 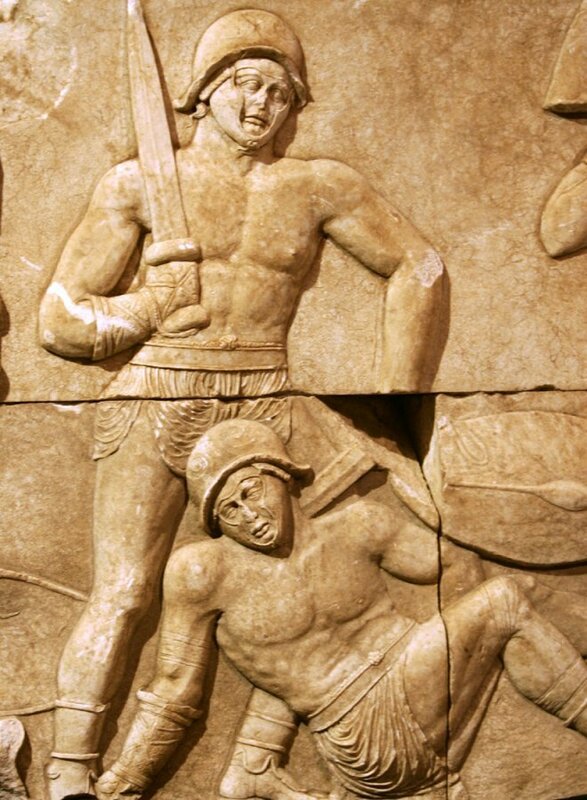 It seems that the first type of gladiator was the Samnite (from Samnium, a region of Italy), later also called secutor. He was an attacking gladiator, wearing a small shield and the gladius. In the centuries the form of the secutor developed into the hoplomachus, with a bigger shield. Another variation of the secutor could have been the provocator, probably wearing a round shield and a lance, and the Thrax, or Thracian, who was protected by metal and leather, had a small shield and the sica, a curved sabre. 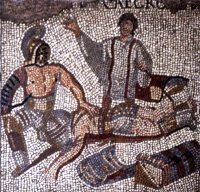 The retiarius had a net to throw on the opponent, a trident and a sword. Sometimes, he was put against the myrmillo, that wore a fish-like helmet (note the symbolic opposition of net and fish) and had a big shield for defence. When he fought he was practically naked. In any case, authors strongly disagree on the subject, given the scarcity of sources and the subtle variations on the same themes. There were also the essedarii, fighting from chariots, like we have seen in the movie The Gladiator, the equites, on horses covered by a cuirass, who fought with a lance, the dimachaeri, without a shield and with a sword in each hand, the laquearii, with a kind of lassoo, the andabates, almost impenetrable, protected as he was by a coat of mail, the pegmares, who made an exhibition with the swords, like modern fencing, et cetera... There were, apparently, also female gladiators; they are mentioned in literature and there even is a bas relief, found in Alikarnassos,that shows two female fighters: Amazon and Achillia. However, the scholars wonder how and where these woman could be trained in the arts of fighting, as the schools were reserved to men. Another categorization divides gladiators according to the kind of show: there were the meridiani, who fought in the morning, the cubiculari, who fought during banquets, the catervari, who "a modo pugnae, scilicet ... confusi mixtique pugnant per catervas" that means "the ones who fight all together in a bunch and in confusion". Titus in Caesarea decided to throw into the arena many prisoners of war, some to the beasts, some others to the catervas, and some more were ordered to fight against each other. 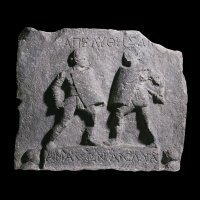 Gladiators 3: Will you live or die after your first fight as a Roman gladiator? Find out what fate awaits you on your journey to the arena. The painting "Pollice Verso", by Jean Le�n G�r�me. It seems that Ridley Scott, director of Gladiator, was inspired by this image: "it spoke to me of the Roman Empire in all its glory and wickedness ... I knew right then and there I was hooked"